We are excited to announce that the North Shore Mountain Bike Association is partnering with IMBA Canada to present the inaugural Western Mountain Bike Advocacy Symposium. 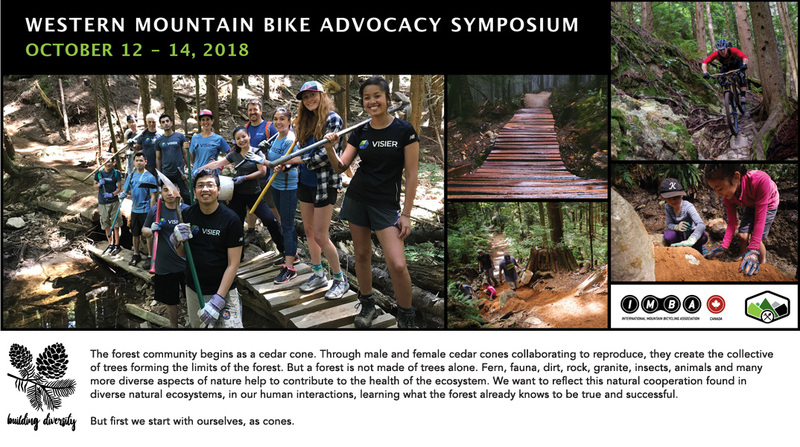 The symposium will be taking place from October 12th through 14th, 2018 in North Vancouver, British Columbia and for the inaugural theme we have chosen “Building a Diverse Mountain Bike Community”. 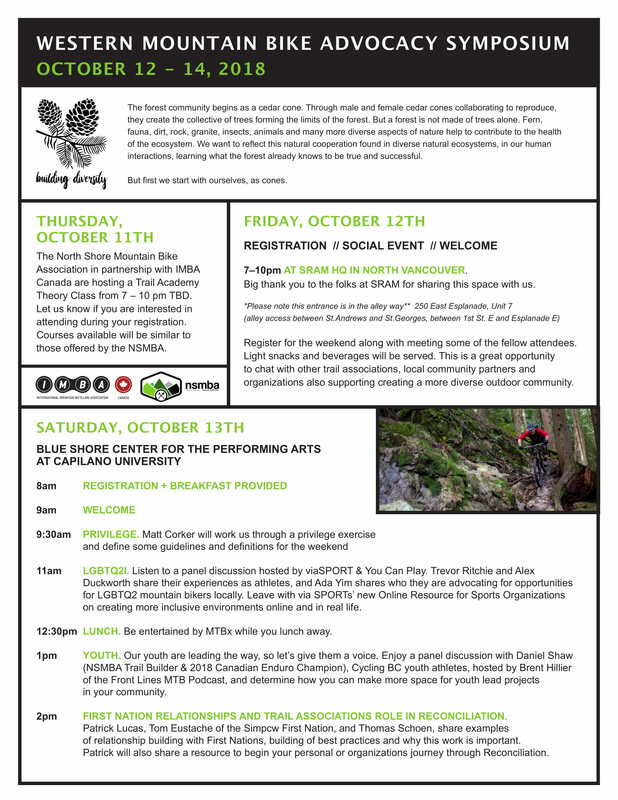 Keynotes, presentations and panel discussions will be hosted on the following topics: Privilege and the Mountain Bike Community, Building First Nations Relationships, Adaptive Mountain Biking, Supporting Youth Voices, and the Media’s responsibility in Representation. Space will be provided to facilitate conversation and answer questions through the delivery of discussion groups and panels. 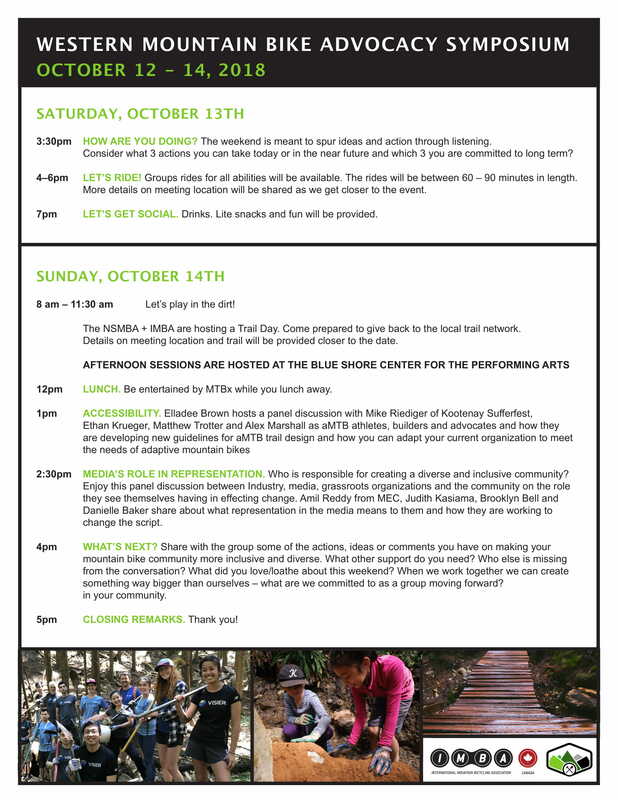 We’ll also be making time for ad hoc conversation and reflection through some organized trail work and numerous group rides! We wish to be a spark that ignites further conversations within individual communities on how each of us has a part to play in ensuring mountain biking is seen as an inclusive and open space for all – building a diverse mountain bike community one rider and trail at a time. We hope that you will join us this fall for this exciting and important discussion! If you have questions please email symposium coordinators Justin Darbyshire – jay.darby@imbacanada.com or Christine Reid – christine@nsmba.ca. Invitees: Mountain Bike Advocacy Groups (Provincial and National), Pacific Northwest Mountain Bike Advocacy Groups, First Nations Community Members, Provincial and Federal Government Staff and Officials, Municipal Government Staff and Officials, Cycling Clubs and Governing Bodies, Tourism Organizations. Sports Organizations. Interested Parties.